Joe sez: There are still many guest posters who contributed to Tess's War on Alzheimer's but haven't scheduled a date with me for their posts. If you are doing a guest post, you have to send me the date you want in an email header (example: TESS GUST BLOG 9/12). The best cartoonists are writers first. In creating a comic strip or cartoon panel, great writing can save poor artwork. However, great artwork never saves poor writing. So if a cartoonist may join you here as a fellow writer, I’d like to share my experiences with you. The earliest reading I remember doing is of cartoons. Like many children, I was drawn to comic strips. For many future cartoonists of my time, Charles Schulz’s Peanuts became a major influence. At 9 or 10 years old, I found the earliest Peanuts strips from the 1950s to be my favorites. They were simple, engaging and absorbing. Without any doubt, I decided to be a cartoonist when I grew up. Yet when I began to pursue the traditional publishing path, the high hurdles and low odds of success were daunting. First, a cartoonist submitted their comic strip to a handful of syndicates. If accepted, a syndicate would package and sell your cartoon feature to newspapers. Syndicates received hundreds of submissions a year and only chose two to five to distribute. Of course, this service came at a cost for the lucky few (lengthy contracts, revenue splitting, ceded creator’s rights). I, too, collected my rejection letters. Some even had personal notes written on the syndicate’s form letter responses. So encouraging! Second, newspaper editors had to buy and publish your comic strip. A critical mass of 50 or so newspapers would allow for a modest income for the cartoonist and acceptable profit for the syndicate. If a cartoon feature failed to achieve this, it would be cancelled. More comic strips died at this stage than lived on. Third, the market for new comic strips is highly competitive. In paper and ink, there is only so much space on the page. For any new feature to break in, others must drop off. Comic strip features like Snuffy Smith, Beetle Bailey and Garfield have occupied their spaces for decades. My beloved Peanuts is in print reruns today -- twelve years after its creator’s death. When someone’s passing doesn’t open up a spot for a newcomer, you know rigor mortis has set in on the funny pages! Fourth, the decline of the newspaper industry is now well known. In the face of the Internet publishing revolution and changing reader habits, newspapers have been slow to change. As a result of their old business models falling apart, the industry is contracting. For cartoonists selling only to this market, that is not good news. Fellow writers, does this sound familiar? You won’t be surprised to hear that many cartoonists are looking for alternatives to traditional publishing in the same way writers are. These creators are making their own success stories. · Self publishing comics online (a.k.a. “webcomics”) boasts several success stories. There are too many to cite here! · The self published comic, Order of the Stick, raised over $1 million on Kickstarter to fund reprints of its archives. · Comixology has established itself as a digital platform for mainline and independent comic books. For myself, I’ve taken my inspiration from Joe Konrath and many others who are blazing their own trail with ebooks. For ten years, I drew my own comic strip which appeared in a number of alternative newsweeklies and online. Some of my most funny, popular strips were tongue-in-cheek “reasons to hate cats” which cat owners would appreciate. From here, I had a spark that determined what I would do next. Moving to ebooks, I saw the old comic strip format did not fit well with the new ebook form. I knew I had good material and I wanted to share it in a new way. It needed to work well on ereaders and other devices. So I took to redrawing those cartoons to have them reborn into a new digital form. It was (and still is) exciting work. You can see the results in 99 Reasons to Hate Cats: Cartoons for Cat Lovers (free on Kindle 9/12 to 9/16). 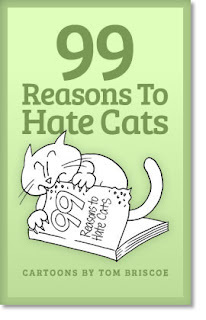 The sequel, 99 More Reasons to Hate Cats, is on its way soon. The best of my original comic strip collection is available as the Small World Comics Sampler: Pop Culture, Politics and Pandemonium in Kindle format as well. In ebooks, cartoons and comics are just beginning to come into their own. The improving displays of the Kindle Fire, iPad and other tablet devices lend themselves well to this highly visual art form. Books as “apps” for your phone or tablet and new ebook formats like Kindle Format 8 open up new possibilities. It is inspiring to look around and see what can be done. For writers and cartoonists alike, I encourage you to create. I encourage you to experiment with new formats in the new forms. Try new ways to sell, reach new audiences and create an income from your art. Keep getting better. The opportunity is there and I look forward to seeing many more of us succeed. Joe sez: Experimentation is the key. Two of the biggest videogames right now are Minecraft and Roblox. These games have no real point, other than to allow the user to build stuff. The games give you the tools, and you use your imagination to have fun. Kindle is a tool. But very few people are using their imaginations to fully utilize that tool. 99% of self-publishers publish regular old ebooks. But there are many possibilities beyond that. A few years ago, I pubbed BANANA HAMMOCK, one of the first choose-your-own-adventure style ebooks. I'm currently working on a project with my cover artist to make an interactive multimedia variety show in ebook form. I just released GRANDMA?, taking a shot at serial novels. I've done box sets of my own work (JACK KILBORN), and with others (like Blake Crouch with BEGINNINGS), and Blake and I also split SERIAL KILLERS UNCUT into five different parts, all earning money. More innovation is needed if the bar is to be raised and readers' interests kept.